Happy Friday! Summer weekends are the best. Although, this weekend isn't technically Summer, and my kids aren't on Summer vacation yet ... but it's still a Summer weekend! I hope you have some great plans lined up. The kids and I will have lots of fun. I promised them an exploratory hike along the creek. This will be the last normal "What I Wore" for a little while. I've decided to do a Style Challenge in June! More on that below. But first, here are a few recent outfits. If not already obvious, I love me a bargain. This dress was $15 a few years ago at Old Navy. It's a really pretty, delicate, easy dress. It also wrinkles like crazy, but that can't be helped. I usually wear a belt with it, because otherwise the waist looks a little boring. Today I wore a very old "cayenne" colored sash from j.crew. This was one of those oddly cool days in May. I love these tan pants - they're from the Ann Taylor outlet a few years ago. The navy tunic was a buy from Loft at one of the big sales a few months ago. It's a navy linen. I wore it with a long necklace from j.crew factory. Another date night outfit here. This was a casual night out, so I didn't need to get too dressed up. I wore this fun new tee that I got at TJ Maxx for $10. I'm always looking for tees that are cute enough to wear out. The jeans are boyfriend-style jeans from the Gap. Jamie and I each got a pair of these at the Gap outlet. I wore my leather booties (since it was a cooler night) and my white denim jacket. My jacket, I confess, is from Wal-Mart. A few years ago I needed a sweater or jacket for a party and was already out, so I stopped quickly into Wal-Mart just to find something - anything - and found this jacket. I wear it *all the time* and love it. And now for the Style Challenge! I've decided to do one just like I did last year. 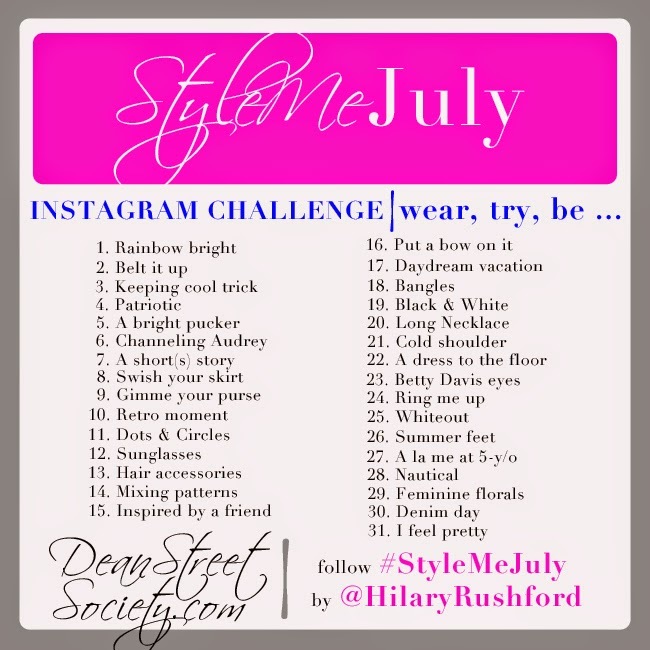 Only, I couldn't find a challenge for this June, or even last June, so I am using the Style Me July challenge from Dean Street Society. And to make it more fun, my friend Toya is doing it too! We had to tweak some of the days a little given my work schedule, but we are mostly following the below. I'm only doing weekdays. I'll post the first week's outfits next Friday and keep doing weekly recaps until the end of June. This will be fun! Stay tuned! And have a great weekend. Oh Pickles. Mother Pickling Pickles. Pickler!